Sydney Palese, St. Mary’s marketing communications intern this summer, originally wrote this story for inclusion in the Combined Federal Campaign special section that appeared in military newspapers. We thought it fitting to post this on our blog on Veterans Day. Emma and her parents chat after Emma’s dinnertime and their lunchtime. Richard Bowman, a submarine-qualified electrician’s mate first class, and his wife, Christine, sit in their San Diego, Calif., home as the sun is high in the sky, and Emma squirms about in her chair at St. Mary’s Home in Norfolk, Va., as the sun outside is setting. Mother and daughter play peek-a-boo and blow kisses. And although about 2,700 miles and three time zones stand between seven-year-old Emma and her parents, the family’s unwavering love, aided by modern technology and the staff at St. Mary’s Home, brings them together for the evening. A lot can change in a year. 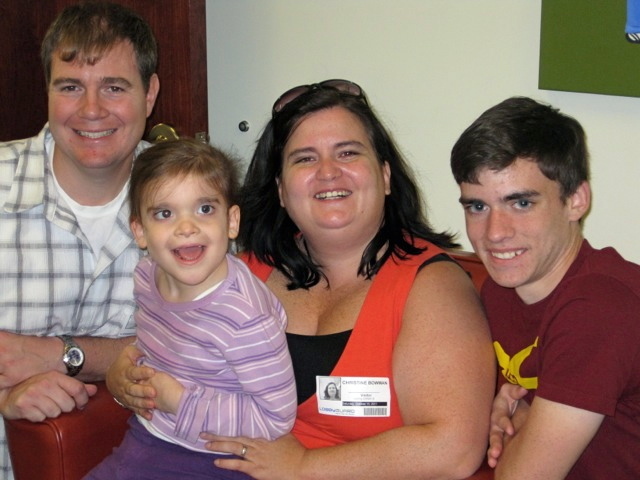 During the summer of 2011, a friend referred the Bowmans to St. Mary’s Home, which cares for children and young adults from throughout Virginia who have severe intellectual and physical disabilities. When Emma’s pediatrician suggested that Emma might need more full-time care, Christine and Richard took a tour of St. Mary’s. Christine said the warmth of the staff and the way they treated the children made the Home feel like the right choice for their daughter and Emma was placed under the care of St. Mary’s Home that September. Because Emma lived at home and fell into the U.S. Armed Forces Exceptional Family Member Program as a category five (five being the most severe), Richard could not receive orders to be stationed elsewhere. However, within weeks of Emma being placed under the care of St. Mary’s Home, Richard found out that he would be sent to San Diego. In January, the Bowmans were on a plane to the West Coast. Despite the distance, the Bowmans remain determined to stay involved in Emma’s life. Every six weeks, Christine visits Emma at St. Mary’s Home, paying for airfare and travel expenses out of pocket (about $1,000 per visit). The trips last for about four days and in that time, Christine tries to balance fun and quality time while blending into Emma’s routine. Christine brings treats for Emma to eat and they Skype with Emma’s extended family members. 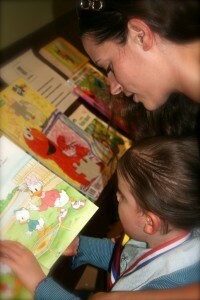 But of all the activities that Christine and Emma do on these visits, Emma’s favorite is reading. “Give her a book and she’d be happy,” said Christine. Though Christine and Richard’s visits to St. Mary’s Home are a time to be treasured, it is the time in between visits that are the most trying. Christine acknowledges that it is hard to keep in touch with Emma due to the time difference. However, Emma’s support team and staff members at St. Mary’s Home have rallied behind the Bowman family and have worked vigorously to keep the family in touch with every aspect of Emma’s life. Every Friday, Christine and one other family member, usually one of Emma’s four brothers or Richard, will Skype with Emma. Though Richard is frequently on deployment, he makes every attempt to Skype with Emma when he can. Christine notes that the physical therapy staff and Emma’s teachers email her with photos and send classwork in the mail. Lauren Burnett, Emma’s support coordinator, frequently emails Christine with updates. Christine also keeps up with Emma via St. Mary’s Facebook page, which recently featured a story about Emma’s participation in a race with members of Team Hoyt VB, a Virginia Beach-based running organization that strives to help people with disabilities play an active role in their community. Emma has made great strides since coming to St. Mary’s. According to Christine, when Emma first arrived at the Home, she could walk, but with great difficulty. Now Emma is on the move. Christine also said Emma is happy at St. Mary’s, which provides around-the-clock medical, therapeutic and recreational services for residents ages newborn to 21 years; St. Mary’s also partners with Southeastern Cooperative Educational Programs to provide educational services. Grants, donations and contributions through United Way and the Combined Federal Campaign help cover the costs of care at the private, nonprofit St. Mary’s. The Albero House, which will care for adults over 21, is expected to open on St. Mary’s campus in early 2013. Christine said she plans on returning to the Hampton Roads area next summer after Emma’s older brother has graduated high school and is off to college. Richard will join her shortly thereafter. For now, the family will continue to work alongside the staff at St. Mary’s and enjoy the trips and Skype calls until they are able to be reunited in a year. Maggie Seymour presents Emma with her medal. Seymour followed Emma into the St. Mary's library to flip through several of the books. 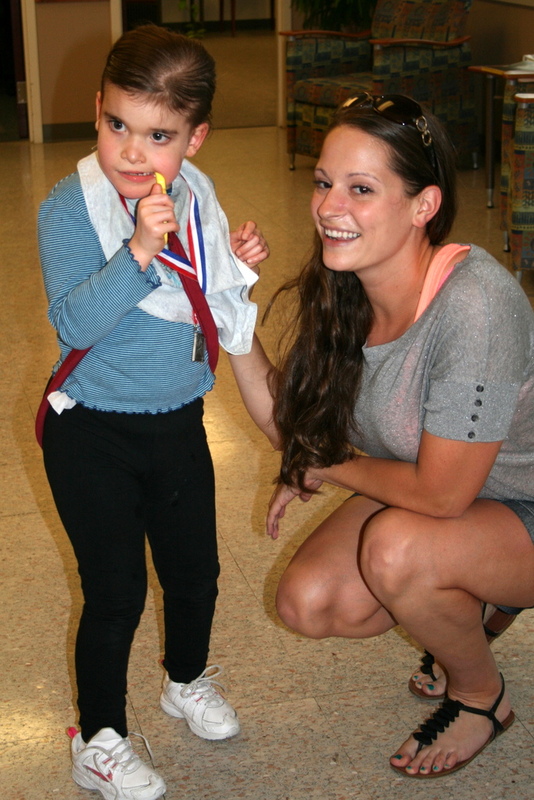 Last month in Holland, Mass., Team Hoyt VB runner Maggie Seymour and St. Mary’s Home resident Emma crossed the finish line in a triumphant second place victory. Recently, Seymour, a captain in the Marines, reunited with Emma at the Home to present her with the medal they had received and a photo of the two at the race. Seymour said that during the race, Emma kept reaching up through the sun screen on her jogging stroller to wave to the cheering crowd. Team Hoyt VB is a Virginia Beach-based organization associated with Team Hoyt, which gives people with disabilities the opportunity to play an active role in their community. Team Hoyt VB runners have participated in several races, including St. Mary’s 5K.